Mad about the boot! Just one question…Biker, Cowboy or Tractor Tread? This last year has seen me pretty much shelve the skyscraper heels…oh the horror, cover your eyes and ears die hard Louboutin lovers. Now don’t get me wrong I still love a heel of any kind…actually scrap that…I still love a heel of any kind EXCEPT…Kitten heels, I loath kitten heels!! This last year however my heels seem to be getting lower and lower. I seem to have gone from a skyscraper, to a cuban, to well…nothing. As well as that, apart from my current brogue obsession I’m hardly even wearing shoes. This past 12 months has been all about boots for me. I’m totally obsessed, black, white, brown, grey, studded, cut out…the list goes on…and on! The start of the year saw me rocking cowboy style boots. I couldn’t get enough of those chubby little cuban heels. My favorites were my grey cut out London Rebels, Black and gold Moda in Pelle’s and gold studded Bertie’s…much to my mothers horror, she hates them with a passion! September (naturally, what better time is there to mix up your style than the start of the new fashion calender) saw me changing over to bikers. As the weather gets colder I find myself unable to resist the temptation that is my Uggs. Probably the ugliest and laziest looking boots ever invented, they are however a forgivable fashion faux pas…excused only by their ability to remain one of our trusted wardrobe staples! I was in America in 2012 and invested in some Ugg Biker boots. Up until this autumn I have hardly worn them. They are a lot more structured than your traditional Ugg so aren’t quite as comfy. However after I accidently spilt a can of oil based paint all over my my beloved brown uggs this year…what an idiot… I decided not to replace them. Instead I have been wearing the bikers and I’m now in love with them. This of course led to a new obsession…obvs…with biker boots of all descriptions. 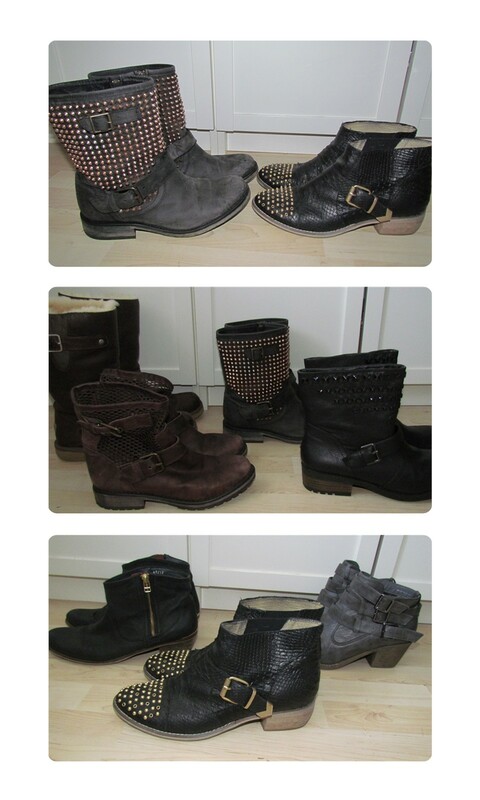 Steve Madden has been my favorite designer with his Monicaa’s being the best in my collection. Not only are these gorgeous boots comfy as hell but they also hide the mohassive socks that keep my feet toasty in the winter months. I am really undecided as to which style I love more…Cowboy or Biker? Cowboy definitely wins the war when I’m off out in a LBD but then with my jeans and knitted jumpers or layered looks I’m loving the bikers. Either way, which ever way I veer one thing’s for sure…there’s a new boot in town, it’s time to get down with the likes of Prada and Stella McCartney and buss-out the the tractor treads because they’re about to take over…and we thought the ugg was ugly!! What about you guys, have you got a preference? Let me know your thoughts, you know I love to hear them. OOTD – Feeling a bit MIC!